Do you need to book the Inca Trail in advance? YES! It is recommended that you make a reservation for the Inca Trail, check the spaces available online and pay for your entrance fee well in advance. It is very important to book this trek a good time in advance!!! 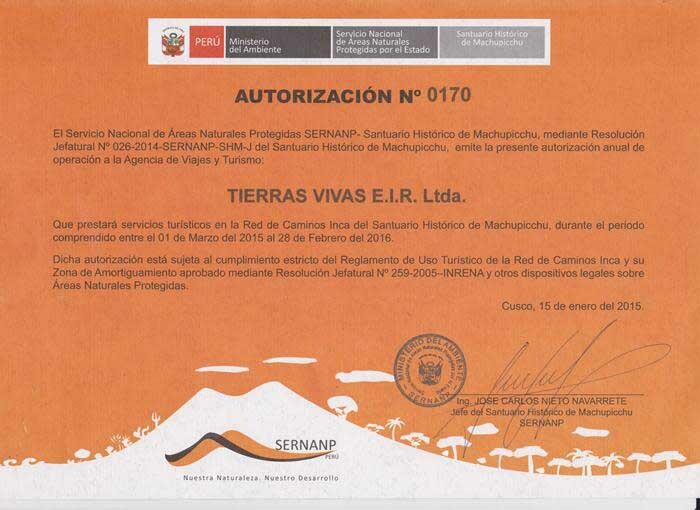 The number of trek permits is limited to 500 per day (about 200 tourists and 300 trekking staff) This includes the 2 and 4 day treks as well as the Salkantay 7 day trek. The estimate is 160 trekkers per day on the 4 day trek, 25 on the 2 day trek and 15 on the 7 day trek. How to book the Inca Trail trekking? The Inca Trail to Machu Picchu is 42 kms (26 miles) long. Campsites along the Inca Trail are assigned by the Ministerio de Cultura Descentralizada and for this reason it is difficult to determine the distance to be covered in a day but expect to walk 6 to 9 hours per day. Cusco - Mollepata – Salkantay Trek – Machu Picchu 7 day trek – Moderate to Difficult. Are numbers of day visitors to Machu Picchu also limited, like those doing the inca trail hike? Yes, there are limit to Machu Picchu number of visitors 2000 per day and Inca Trail 500 per day, everyone can visit the ruins . What is the price of the Inca trail and where I can to book the Inca Trail trek? Prices for the 4 day group service Inca trail trek generally range between US$550 and US$600 per person including entrance fees to Inca Trail and Machu Picchu and return on train. This price includes Peruvian sales tax known as tax which is currently at 19%. A US$30 discount is offered to students who have valid ISIC cards and to children under 16 years old. This is the standard service offered by most tour operators in Cusco and offers the most economic way of hiking the Inca Trail as part of an organized group. Although services can vary from operator to operator, generally speaking, the following services are included: Private transportation to the headtrail to Inca Trail, professional guide, assistant guide for groups of 9 and over, entrance fees (US$ 105 adult or US$52.5 student), double tent, thermarest mattress, cooking equipment, cook, meals, porters (to carry the tents, food and cooking equipment only) and return to Cusco on the Expedition train service (currently US$ 78). The following items are not usually included in the Inca Trail: Breakfast on day 1, snacks along the trail, tourist bus from Machu Picchu to Aguas Calientes (US$ 12), meals on the final day apart from breakfast. Every year, thousands of people do the Inca Trail. They usually complete the 43-km trail in 4 days. For most of them, the trip is their lifetime experience and fulfillment of their personal ambitions. The satisfaction of having completed the trek and visiting the spectacular Incan city of Machu Picchu is hard to beat. Although, this feeling is even better if you know that all porters helping you along the way have been treated well and with the respect they deserve. Now, most of trekkers are organized by a local tour operator. No draughts are allowed to enter the Inca Trail, only porters. For that reason, all camping equipment (i.e. personal tents, dining tent, kitchen tent, tables, chairs, stove, bottle gas and food) is carried on backs of human porters. Prices of this 4-day trek vary significantly depending on porter´s and other staff´s wages and conditions provided by each company. However, if you try to find out if a company looks after their porters well, it can be quite difficult as porters can be instructed to tell you they receive more than they really do. They are also afraid to not lose their jobs. In April 2002, a new law was introduced that have improved porter´s working conditions dramatically!! The law came into force due to many years of exploitation!! New minimum wage for all porters was set to USD 10 per day. In 2005, the wage increased to 43 Soles (USD 15) per day. Even though, the law exists, it is not being enforced and many companies still pay their porters as low as USD 5 per day. New maximum weight that a porter can carry was limited to 20 kg (15 kg of load + 5 kg of porter´s personal items) compared to previous 45 kg. All porters have a weight carried checked by government officials at checkpoints of the trail. However, even this system is abused and many tour operators push their Tour Guides and Tour Guide Assistants to carry lots of loads across the checkpoints and behind them, they drop the loads to be picked up by porters. Tourists, who have hired a personal porter, are frequently asked to carry their own backpacks through the checkpoints as well. If you hire a personal porter, do not accept this practice and ensure that your porter is fully loaded when he is being weighed at the checkpoints. Some of the worst companies restrict the amount of personal items, which a porter can take with him, imposing upon his personal allowance of 5 kg. Most of porters are afraid that if their blankets are too heavy or they have packed too many warm clothes, they exceed the 20 kg weight limit and receive a fine, which a travel agency then deducts from their wages. Obviously, a decent travel agency does not practice such activities!! Talk to your porters, learn about their traditions and villages. Share some coca leaves. Even ask them to sing some of their local songs. Most porters suffer from low self-esteem so make the first move, do not wait for them to talk to you first. The biggest difference between a responsible company and an irresponsible is how they look after their porters on the trek. Many porters are given very little to eat on the trail. They have to wait to see how much tourists have eaten before left-overs are divided up amongst them. Many porters end the trail tired and hungry. In general, porters sleep together in the group dining and kitchen tents. This is fine since there is warmth in numbers. However, when you are on the Inca Trail, remember not end up talking all night in the dining tent as there might be tired and cold porters waiting outside to go to bed. You may also notice that very few dining tents have integral floors to keep out the cold and damp. When it rains the floor can become like a river running through the tent. Very few porters have sleeping mats or even warm sleeping bags. They usually put one blanket on the ground and cover themselves with another one. Quechua´s (native Andean) people have a history of being down-trodden, first by Incas, then by Spaniards and then by landowners. Thanks to recent reforms, some Quechua´s people possess their own land, but just a few of them. Due to their long history of being dominated by others, they have mostly a low self-esteem. It is important to try to involve them into your group. So take some coca leaves and share with them. You can also try to learn a couple of basic Quechua´s words (your Tour Guide will be pleased to help you). Many of porters have amazing stories to tell about their traditions and life in their villages. At the end of the trek, do not forget to show them that you appreciate their work and thank them verbally as well as by tipping them. How much to tip on the Inca Trail? What to take for the Inca Trail to Machu Picchu? If very important your take best cover backpacker, because the weather in Inca Trail to Machu Picchu is change every date, we can’t predict it raining or no. If you don’t have, we recommended to putting your clothes, sleeping bag and other personal equipment inside the plastic bag. You have to be fit. It is a common misconception that because many people do the Inca Trail then it must be easy … it isn’t. The trail is 45km (26 miles) long and involves great physical exertion to complete. On the second day you climb nearly 1200m (about 4000 ft) in the morning. Combined with high altitude (lack of oxygen) and extreme weather (you can easily burn in the high altitude sun during the day and temperatures can drop to below freezing at night) the trek can be hard work. However all this suffering can make the final arrival at MP all the more enjoyable. The maximum allowed group size is 16 persons. Normally the group tours are between 12 and 16 persons. They spelled wrong my full name on my Machu Picchu ticket, Am i going to be in troubles? It is not only that, sometimes they sell you a ticket for another date, is that a problem?, the answer is no. Machu Picchu has no limit of visitors per day, so you can visit this awesome place whenever you want if you have a ticket. Beside that, there are several problems with names on tickets, spanish speakers sometimes hardly understand foreign names and they write it as they want, but there is no problem with that to visit Machu Picchu, the only thing you have to make sure they don’t mess up with your passport number, that’s the only thing that can’t be wrong, seriously, it can’t be wrong. On top of that, sometimes they will sell you a ticket for a different date. Is that a problem? The answer is no. Machu Picchu has no limit of visitors per day, so as long as you have an unused ticket, you can use it whenever to visit this awesome site. Something to note- you may notice that your name is spelled horribly wrong on your entrance ticket. With the wide variety of nationalities with non-Spanish names coming through, it’s common, but also not a problem. It IS a problem if they write your passport number incorrectly, so don’t leave after purchasing until you double-check that! It won’t be valid, even if it’s one number off, so make sure!